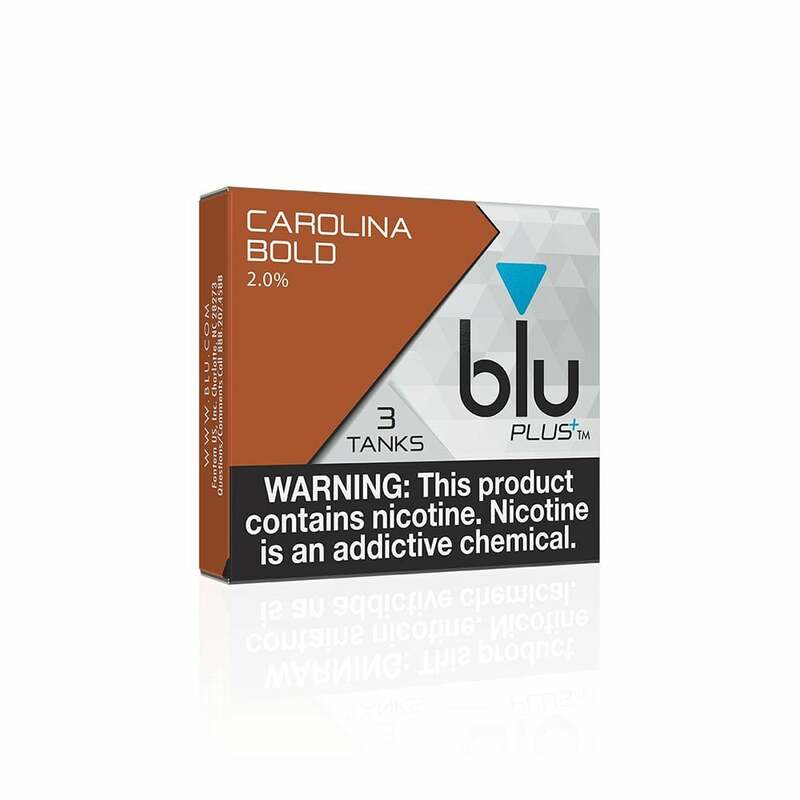 An intense and authentic tobacco flavor for your BLU e-cig kit, BLU Carolina Bold gives a consistent and satisfying vape experience. Carolina Bold is the BLU e-cigarette brand's best cig-a-like e-liquid. Rather than bottled e-liquids, Carolina Bold comes in trademarked blu Tanks™. Each Tank™ is in a cartomizer format and is easily placed within your blu PLUS™ e-cig. There are a range of different flavors in the Tank™ range but Carolina Bold is the one you need if you’re looking for a pure and simple tobacco vape which delivers. Each order of Carolina Bold Cartomizers comes with three individual blu Tanks™ cartridges. Each Tank is equal to a puff count of around 550+ so each three-pack should last awhile. Carolina Bold does not disappoint when it comes to authenticity. It has a full-flavored tobacco taste which keeps it traditional and it has a boldness to it which makes it stand out and taste fantastic. There are a wide range of ‘authentic’ tobacco liquids and cartridges on the market but not many hit the mark as well as BLU Carolina Bold. There is an underlying sweetness to the flavor which makes it even more enticing but it is the classic, traditional tobacco which is perfectly replicated that makes this flavor popular. Each BLU Carolina Bold Cartomizer has a 20mg nicotine level and they are made in the USA. The formula for the liquid is made up of both domestic and imported ingredients of the highest quality. It is a great choice for cigarette smokers looking to move to vaping and the whole BLU range of products have a cig-a-like appearance. They are small and compact in size and for a traditional tobacco experience, Carolina Bold is your perfect choice. In addition to purchasing your BLU Carolina Bold Tanks™ it is worth checking out the other BLU products in our range. It is also possible to add a Plus+ Battery to your cartomizer order. 3-pack of blu Tanks™ Carolina Bold Cartomizers. I’ve been looking for something to replace the Vuse tank. Tried the fin v tank, was always leaking. These are.. good enough. I appreciate the timely delivery and the special pricing.